Weld Neck Flanges are drilled with the wall thickness of the Flange having equal dimensions to the matching pipe. The lighter the pipe is the larger the bore is in the Weld Neck Flange. And conversely the heavier the pipe is the smaller the bore is in the Weld Neck Flange. 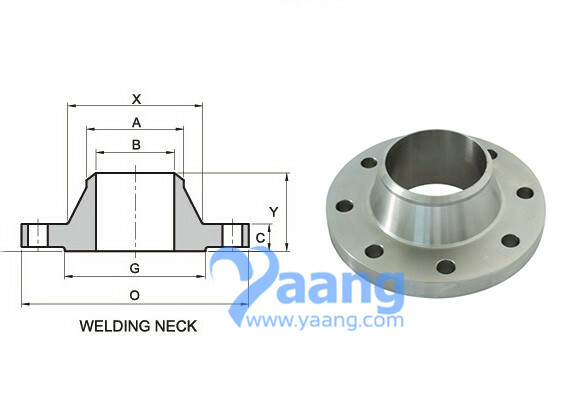 Weld Neck Flanges are usually used in high pressure systems and are suitable for cold or hot temperatures. ANSI/ASME B16.5 Class 600 Weld Neck Flanges are used in Chemical and petrochemical processing. 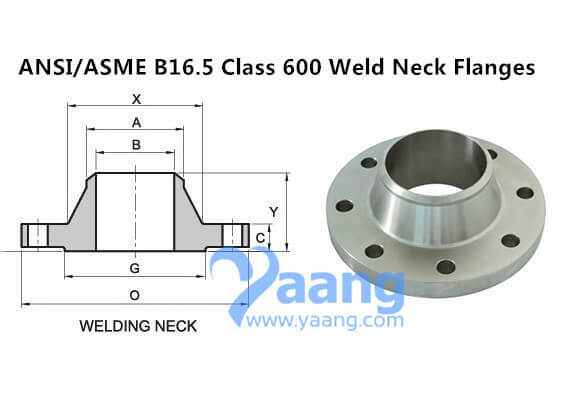 ANSI/ASME B16.5 Class 600 Weld Neck Flanges are used in electronics. ANSI/ASME B16.5 Class 600 Weld Neck Flanges are used in processing equipment for maintaining product purity in handling foods, synthetic fibers. ANSI/ASME B16.5 Class 600 Weld Neck Flanges are used in marine and offshore engineering. ANSI/ASME B16.5 Class 600 Weld Neck Flanges are highly resistant to various reducing chemicals. ANSI/ASME B16.5 Class 600 Weld Neck Flanges are excellent resistance to caustic alkalies. ANSI/ASME B16.5 Class 600 Weld Neck Flanges are high electrical conductivity. ANSI/ASME B16.5 Class 600 Weld Neck Flanges are excellent corrosion resistance to distilled and natural waters. ANSI/ASME B16.5 Class 600 Weld Neck Flanges are resistance to neutral and alkaline salt solutions. ANSI/ASME B16.5 Class 600 Weld Neck Flanges are excellent resistance to dry fluorine. ANSI/ASME B16.5 Class 600 Weld Neck Flanges are widely used to handle caustic soda. ANSI/ASME B16.5 Class 600 Weld Neck Flanges are good thermal, electrical and magnetostrictive properties. ANSI/ASME B16.5 Class 600 Weld Neck Flanges offer some resistance to hydrochloric and sulfuric acids at modest temperatures and concentrations. Pipe Normal Diam. O.D. Flange Thk. Of Flange Min Diam. of W.N Length Hub Diam.